GUARANTEED NOT TO IMBED - WILL NOT CONTINUE TO CUT! All compounds have a range of particle sizes with most of the work being done by the largest particles. The selection of the grade depends more upon the amount of metal to be removed than the finish because the abrasive breaks down to a finer and finer size and eventually to a polish material. *DISCLAIMER: This sheet is provided only as a guide for selecting the correct Timesaver Lapping Compound Grade for your application, it represents typical properties of the product described and is not intended for use as a technical specification. Actual Grain Size may vary. Newman Tools Inc. makes no representation or warranty concerning the Products, expressed or implied, by this Product Data Sheet. Timesaver Lapping Compounds are not affected by temperature changes and keep indefinitely. Keep dry until use. At the time Timesaver Lapping Compounds are mixed with oil and/or grease for use per the instructions for use, they then assume any shelf life associated with the chosen carrier. 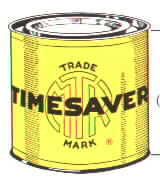 Mix TIMESAVER with oil as you use it and only the amount needed for the particular job to be done. Keep well mixed. SPLIT BEARINGS - Mix TIMESAVER COMPOUND with light or medium oil to the consistency of a thin paste and apply to the bearing halves. Add a little oil to the surfaces; also apply oil to the shaft. Both up cap - not too tightly, just so shaft can be easily turned by hand; then proceed to lap. At intervals add sufficient oil to the surfaces to prevent them form becoming dry. Take up on bearings gradually as high spots are removed, applying fresh compound when necessary. HOT BEARINGS - Mix a small amount of TIMESAVER with oil. The mixture must be very thin. Apply freely to bearings and shaft through oil holes. Rotate the shaft. Add the thin mixture until bearing is free. Then flush out with diesel or Stoddard Solvent. TIMESAVER COMPOUND will not imbed into any metal surface and will not continue to cut. for lapping cast iron, steel, and hard bronze. CAUTION - Do not use Hard Metal Compound (GREEN Labeled Can) on babbitt, brass, aluminum or bronze. For this work, use our soft metal compound (YELLOW label can). TIMESAVER can be used on any hard metal friction surfaces where accurate fits are required, such as valve seats, machine tool ways, tool room applications, etc. Timesaver - Lapping compounds - Guaranteed not to imbed - Will not continue to cut! Timesaver lapping compound does not contain emery, aluminum oxide, silicon-carbide or similar charging abrasives. They are unconditionally guaranteed not to imbed into any metal surface. Prepared in powder form, to be mixed with oil as used. Timesaver first acts as an abrasive, then the particles diminish to a polish, and finally to inert material.